An incredible rush of energy ran through my body as I made my way through downtown Geneva and up the street toward the Bike Switzerland Welcome Center. I had been waiting for this day for months… and now it was finally here! I was in Geneva, Switzerland for the start of an 11-day guided bicycle touring adventure known as the Bike Switzerland Challenge Tour. I couldn’t wait for the experience to begin! Inside the Bike Switzerland headquarters in downtown Geneva I met up with John Klemme (the owner of Bike Switzerland) and Eric (an American intern working for John over the summer holiday). John welcomed me to Geneva and handed me a large packet containing some information on the bike tour, the route we would be taking, names of everyone participating in the tour, a cell phone and charger, and a stylish Bike Switzerland cycle jersey. Then John took me through the ropes. He explained how the tour was going to work, at what time we’d be starting the next morning, how many other people were participating in the tour and a whole lot more. Of the ten total people participating in the Challenge Tour, I was the only one to bring my own bicycle. So, instead of fitting me on one of the new BMC hybrid bicycles that are used by most of the tour participants for the bike ride across Switzerland, John showed me how to use the Garmin eTrex GPS we would be using for the duration of the tour to help us navigate from one location to the next. Then John led me to the hotel right down the street where each of the tour participants would be staying that night. I shook John’s hand and agreed to meet him and the other tour participants in the lobby of the hotel at 6 PM that night. I spent the rest of the day walking around downtown Geneva by myself. I meandered into a few local stores, took some photos of the city and ate a delicious subway style sandwich at a local deli. Down by the water I watched a crowd of tourists and locals alike wander up and down the lake where boats were sailing and water was being blasted high into the sky by the city’s famous Jet d’Eau. Around 5 PM I returned to my hotel room and met Barry, the man who would be my roommate for the remainder of the tour. Barry was a 40-something-year-old podiatrist from Australia who had decided to join the Challenge Tour after I announced my decision to participate in the tour earlier this year. It was great to actually meet one of my readers in person and to know that we would be spending so much time together over the coming days. After Barry and I made our introductions, I took a shower and then prepared to meet the rest of the tour participants down in the hotel lobby. I was both nervous about meeting everyone and excited to learn about the people I would be traveling with while on the tour. As the first two people to arrive in the hotel lobby, Barry and I sat down on one of the plush hotel couches and waited to meet the other tour participants. Jo (short for Joanne) was the first person to sit down on the couch next to Barry and I, and we quickly made our introductions. Jo was from New Zealand and was in Geneva visiting her daughter who had recently moved there for work. While searching the Internet for things to do in and around Geneva, Switzerland, Jo stumbled across the Bike Switzerland website and decided that a bike tour across the country might be a fun thing to do while visiting her daughter. Kevin entered the room next and again I was quick to introduce myself. Kevin, like Barry, was from Australia and had heard about the Bike Switzerland Challenge Tour after I mentioned it here on the website at Bicycle Touring Pro. Like Barry, Kevin decided that a bike ride across Switzerland with a small group of people would make for an incredible experience, and so he had flown half-way around the world in order to participate. Soon after hearing Kevin’s story the room filled with people participating in the tour. There was Phil – a computer programer from the east coast of the United States; Rob – an enthusiastic high school teacher from Canada; Adriana and Fernanda – two friends and hospital doctors from São Paulo, Brazil; Gary – a retiree from southern California who had already been on two previous Bike Switzerland bicycle tours; and Ian – a financial adviser from the American east coast. There were ten of us in total, but where were the guides? Just as soon as all ten tour participants had gathered in the hotel lobby, in walked John, Eric, Mark and Claude. John and Eric we had all met earlier in the day when we were being fitted for our bicycles and instructed on how to work our navigational GPS units. Mark and Claude, however, were new to the group and John wasted no time in making their introductions. John explained that Claude was not only an experienced bicycle traveler who had spent more than fifteen total years riding a bicycle around the world, but that he was the author of two different books about his travels. While this would be the first time Claude had ever led a group of people across the country on any kind of guided bicycle touring experience, John let us know that he was more than capable of getting us to our destination on the other side of the country. Mark was the second half of the leadership on our tour. While Claude would be riding bikes with us each day and making sure we didn’t get lost as we cycled our way across Switzerland, Mark was in charge of driving the support van. He loaded up our bags in the morning, set up our picnic lunches in advance of our arrival each day and delivered our bags to our individual hotel rooms so they would be waiting for us when we arrived each evening. After a circle of introductions, we left the hotel lobby and wandered down to the lake. Out on the Jetée Des Pâquis, a narrow strip of land that protrudes out into the center of Lake Geneva, our group huddled around a park bench and spent a few moments getting to know one another while sipping from small cups of white wine. After a few minutes of conversation, we walked back down the jetée in the direction we had come from just a few moments prior and had dinner at the Buvette Bains des Pâquis – a small outdoor restaurant situated in the middle of the narrow jetée. Conversations about where we were from, how we had heard about the Bike Switzerland tour and why we had chosen to participate in the adventure dominated the dinner table. When our meal had ended, John let us know that we’d be getting an early start the next day. We were to meet at the Bike Switzerland Welcome Center at 7 AM, where we would work out any final issues with our bicycles and then take off on the first day of cycling about a half-hour later. Claude would be out leader, Mark would be our driver and John and Eric would remain at the Welcome Center in downtown Geneva for the duration of the tour. Returning to our hotel room, Barry and I got ready for bed and fell asleep while chatting about what might happen over the next ten days. Both excited and nervous about the road ahead, we finally drifted off to sleep and woke just a few hours later to the sound of an alarm. Our first day with the Bike Switzerland Challenge Tour was about to begin! Rather than give you a detailed blow-by-blow account of each and every thing that happened on the Bike Switzerland Challenge Tour tour, I think it would be best to tell you what an average day on tour is like. Then I’ll give you a list of what I believe to be the highlights of the overall tour itself. After all that, I’ll give you some additional information on why you might want to participate in this particular bike tour, why Switzerland is such an amazing place for bicycle touring in the first place, how skilled of a cyclist you need to be in order to participate, how to book your tour with Bike Switzerland if you choose to do so, and I’ll give you my thoughts on the bicycles, leadership, hotels and food that is provided as part of the Challenge Tour experience. Finally, I’ll finish this review with my thoughts on the bike tour as a whole. I’ll tell you what I liked most about the experience, what I liked least and what I think Bike Switzerland could do in the future to make the Challenge Tour even better than it is right now. So, what is your average day of bicycle touring like on the Bike Switzerland Challenge Tour? Well, you can expect to get up early. We had to be ready to leave by about 7:30 – 8:00 AM each morning. That meant we needed to be awake, packed, showered and have eaten breakfast by half-past seven. While most of the people participating in the Challenge Tour with me had no complaints about waking up this early, I sometimes found it difficult to get out of bed. I am not a morning person. The good thing about the Challenge Tour, however, is that there is very little you need to do when you wake up in the morning. You need to shower and pack up your things, but that’s about it. After showering each day, simply run down to the hotel lobby and get yourself some breakfast. Large serve-yourself buffets are the norm on tour and each hotel had a similar sampling of food on hand. Bread, jam, eggs and fruit. Yogurt, meat, cereal and more. Coffee or tea? They have that too! Just take what you want and don’t be afraid to go back for seconds. While breakfasts were served early, the quality of food received was always top notch. After breakfast, we were asked to carry our bags down to the support van where our driver, Mark, was waiting to take them from us. After our bags had been loaded inside the support vehicle, we were given back our bicycles. This was the time of day when we checked our tires for proper inflation, greased up our chains and/or adjusted any parts that might need adjusting. By 8 AM (or sometimes a little after that) we were on the road and making our way toward the lunch spot. Each day there would be two or more scheduled stops on our route. These two consistent stops each day were the lunch spot (the location on our map and GPS where Mark would be waiting for us with a picnic style lunch) and our hotel. In between these two destinations, however, there might be one or two other scheduled stops at which our group would rest and take a break for coffee, wine, ice cream, water or a simple bathroom break. In the morning we would cycle anywhere from 20-40+ kilometers before arriving at the lunch spot – usually around 1 PM. Once there, we’d crowd around two small tables that Mark had set up in advance of our arrival and chow down on a scrumptious spread of delicious Swiss foods. Salads, beans, bread and meats were a staple at our picnic lunches. Fruit, chocolate and a variety of drinks were also on hand. Sometimes there was even an extra special dessert! After lunch we’d continue down the road with our next major goal being the hotel we’d sleep at that night. Sometimes we’d ride together in a long line, with one person following the other. Other times we’d break up into small groups, with the faster cyclists riding in the front and the slower ones riding in the back. Claude, our guide, would sometimes spend all day riding with one group. Other times he would jump from one group of cyclists to the next. The pace of the tour was fairly casual, but sometimes I felt as though we were going too fast. Other times I couldn’t understand why we were going so slow. Most of the time, however, I felt that the pace was just about right. And because I had a GPS of my own, I knew that if I wanted to, I could easily break off from the group at any point, cycle at my own pace and meet up with the others later in the day at any of the scheduled stopping places. After a full day of cycling past lakes, mountains and traditional Swiss houses, we’d end each day around 6 PM at a new hotel. Once we arrived at the hotel each night, we’d quickly store our bicycles in some garage or locker on the hotel grounds and then go up to our rooms for a shower and sometimes even a short nap. Between arriving at the hotel and dinner (which was normally served around 8 PM), some of the tour participants would mingle in the hotel lobby. Others took a dip in the pool. Some just hung out in their rooms and relished in their alone time. Around 8 PM each night, the twelve of us (10 tour participants and two guides) would meet in the hotel lobby and then walk a short distance to the hotel restaurant where we were served an impressive three or four course meal. Conversation around the dinner table usually revolved around the sights we had seen that day, the experiences we had had and what the next day of bicycle touring had in store for us all. After dinner, dessert was served. Some of us ordered coffee or wine at this point, but slowly, one after another, we eventually made our way back to our rooms. The next day, the whole thing would start all over again, but the scenery, experiences and people we met along the way were constantly changing. Hiking in the mountains above Wengen: My favorite day of the Challenge Tour was actually during a time when we weren’t on the bikes at all. Instead, my favorite moment took place on the fifth day of the tour – on our rest day. While in the city of Wengen we took a gondola from our hotel up to the top of the mountain and then slowly made our way back to the hotel on foot. The views from the top were incredible! Cycling through the vineyards in the small town of Chexbres: At the end of our first day of cycling we were treated to some of the most magnificent views I have ever experienced during all my years of bicycle travel. Not only were there magnificently manicured vineyards in the foreground, but we had the blue waters of Lake Geneva and the massive mountains of both France and Switzerland to spellbind our visuals in the background. The dinner buffet at our Art Nouveau styled hotel in Wengen: There was a lot of amazing food served to us throughout the Challenge Tour. But none of it was quite as good as the two dinner meals we received at our hotel in Wengen, Switzerland. The first night at this hotel we were treated to a fancy cheese, meat and vegetable dish… and the second night we partook in the best dinner buffet of my life. Yum! Strolling the streets of Luzern: Luzern is such a beautiful little city. It has a big city feel to it, while in reality it is actually quite small. From the hotel we stayed in to the streets of the city itself, the only thing I didn’t like about Luzern was that we spent far too little time there. The descent into Rapperswil: After a long day of cycling and a few challenging climbs, our small group of cyclists from all around the world were treated to a wonderfully exhilarating downhill ride across a long bridge and into the city center of Rapperswil. Like heroic runners crossing the finish line after a long race, the descent into Rapperswil was the perfect ending to a long and memorable day of cycling. Cycling through parts of Liechtenstein and Austria: As if riding a bicycle across Switzerland weren’t enough, one of the other perks of participating in the Challenge Tour is that the route also takes you through the country of Liechtenstein and a small corner of Austria. How cool is that?! People watching along the lake in the city of Lausanne: Half-way through our first day on the road, we stopped for a short while on the shores of Lake Geneva just outside the city of Lausanne. Watching the crowds of people eat ice cream, play in the water, paddle out into the lake on wooden boats and generally enjoy themselves during the country’s warm summer months was a classic Switzerland experience that I will likely not soon forget. Tackling the 400 meter high Brunig Pass: By far the most difficult climb on the entire tour, day six required that we cycle up a steep 400 meter incline known as the Brunig Pass. The narrow, windy road was certainly a challenge, but reaching the top and cycling downhill into the city of Lungern afterward made it all worthwhile. Finishing the tour on the shores of Lake Constance: What a way to finish the tour! After cycling our very last kilometer, we checked into a large, modern, cruise-ship styled hotel on the shore of Lake Constance. From our room, we could see not only the walkers, runners and cyclists passing by on the path outside the hotel doors, but we could see out over the entire lake. Filled with a sense of accomplishment, the sun began shooting rays of light through the clouds floating overhead and I snapped a mental picture so as to remember how I felt at that very moment. Getting to know eleven other people – each from a different part of the world: While cycling across the country of Switzerland is no small feat… and seeing so many amazing places and eating so many delicious foods was certainly wonderful… one of the best parts about participating in the Bike Switzerland Challenge Tour was that I got to share the experience with so many like-minded individuals. I really did enjoy the company of every single person that participated in the bike tour with me and if given the chance to cycle with them again, I would leap at the opportunity. Why Would You Want To Participate In This Bike Tour? I found it fascinating why the 10 people participating in the Challenge Tour had decided to come to Switzerland and participate in this particular guided bicycle touring experience. It was interesting because it seemed to me as though every single person had decided to participate in the bike tour for a different reason. I had signed up for the tour because I knew I was going to be in Switzerland at the same time the tour was taking place and having done a lot of self-supported bicycle tours in the past, I had never participated in a multi-day guided bicycle tour. I wanted to see what the experience was like and compare it with my own independent bicycle travels. Plus, I knew that cycling across Switzerland in the summertime was going to be absolutely beautiful. The other tour participants, however, each had a different reason for being there. One participant had joined the tour because he had always wanted to conduct a bicycle tour in Europe, but was fearful about traveling on his own. Another man participating in the Challenge Tour explained to me that the tour itself was a personal challenge – something he wanted to prove to himself that he could still do, despite his age. Another participant stated that he had no fears about traveling alone by bike, but preferred sharing such experiences with other people. One tour participant signed up just so he could say that he had cycled all the way across Switzerland! And another tour participant explained to me that the reason she had signed up for the Challenge Tour was because she wanted to cycle in Switzerland, but didn’t want to have to deal with shipping her own bicycle overseas, plan the entire adventure, find hotels to stay in each night, worry about what she was going to eat and all the other details that come with self-supported travel. The idea of simply showing up in Switzerland and being guided across the country, from one side to the other, without having to do a lot of work beforehand was exactly what she was looking for. I don’t think there is any one reason you should sign up for a guided bicycle tour like the Bike Switzerland Challenge Tour. I think any reason is valid. In the end, the decision to sign up for a tour such as this is something that only you can justify. But I do think that giving a guided bicycle tour like the Bike Switzerland Challenge Tour a try is something that just about everyone should do at some point in their life – if you can find a way to make it happen! After all, you could choose to go bicycle touring almost anywhere else in the world. In fact, you could go bicycle touring right where you live. So why go through all the hassle of flying to Switzerland in order to participate in a multi-day bike tour like the Bike Switzerland Challenge Tour? Well, the main reason I think you need to come to Switzerland is simply for the scenery. I’ve cycled across dozens of countries all around the world and I have never in my life been to a place more scenic than Switzerland. The country is a never-ending treasure-trove of beautiful landscapes. From the lakes to the mountains, the cities to the villages, Switzerland never disappoints. The place is absolutely breathtaking! Don’t forget your camera. But the country is more that just something good to look at. From a cycling standpoint, the Swiss nation has one of the best bicycle networks in the world. While on tour, you’ll be cycling on a mix of dirt, gravel and paved bicycle paths than twist and wind their way across the country in a magical maze-line manner. You’ll be blown away at just how well signed and thoroughly maintained the bicycle routes in Switzerland are. There are other reasons to come to Switzerland, of course. The fact that almost everyone speaks English is certainly a plus. If you get tired on any day of the tour and decide that you don’t want to cycle all the way to the hotel that night, there is almost always a train nearby that you can jump on and take you to your next destination. The people in Switzerland are really nice as well. The food is great. If you like chocolate, wine or cheese, you’ll be in heaven! Really, there are so many reasons to come to Switzerland for a bicycle tour. The Challenge Tour is not the easiest of the bicycle tours that Bike Switzerland has to offer. However, it isn’t the most difficult bike tour either. The Challenge Tour is an intermediate bike tour that almost any cyclist can complete as long as they do some training before arriving in Switzerland for the start of the tour. Over the course of the bike tour you will be cycling approximately 560 kilometers (350 miles) during the seven days you are actually on the bike. The first day of the tour is spent in Geneva and you don’t cycle on that day. There is a rest day on day five of the tour, so there is no cycling on that day either. And the last day of the tour is spent taking a train from Lake Constance on the east side of Switzerland and traveling back to Geneva on the west. So there’s no cycling on that day either. That means that you’ll be cycling about 80 kilometers (50 miles) on each day of the tour that you are actually riding your bike. In order to participate in the tour you should be able to confidently ride a bicycle, tackle small hills, go for at least 80 kilometers (50 miles) per day, stop your bicycle on command, negotiate your way through light traffic and ride in a line/group with other people on bikes. You don’t need to be a racer or a speed demon to complete this tour. You don’t need to have cycled thousands of miles before signing up. You simply need to have some basic bike handling skills and the desire to get from one side of the country to the other. If you are afraid that you might not have the skills needed to complete this moderately challenging bike tour, you may want to consider Bike Switzerland’s Lite Tour, which also takes you from one side of Switzerland to the other, but traverses through much easier (flatter) terrain. On the other hand, if you are one of those people who is looking for a real challenge, the Bike Switzerland Jura Tour might be more up your alley. While the name of the Challenge Tour sounds like it might be terribly difficult, it is something that almost any cyclist can complete. There are a few hills that will make your legs burn and cause you to break a sweat. There are a few moments when you have to ride on heavily-trafficked roads. But for the most part, the Challenge Tour is something that anyone with moderate bike handling skills can participate in and proudly complete. If you decide that you have both the desire and the necessary skills to participate in the Bike Switzerland Challenge Tour, the next step is to sign up! The tour is a bit pricey (it currently costs 3,850 CHF), but when you compare it to similar guided tours around the world and consider everything that is included with the tour itself, it’s really a pretty good deal. Gourmet picnic lunches: fresh organic salads, farm cheeses, bakery breads, hard sausages, fruit, cakes, wine, beer, soda, etc…. A high-end, fully-equipped BMC bicycle to use for the duration of the tour… with bike bags, water bottle, lock, multi-tool, etc. Your own cellphone so family can call you and you can make calls to other tour participants, etc. 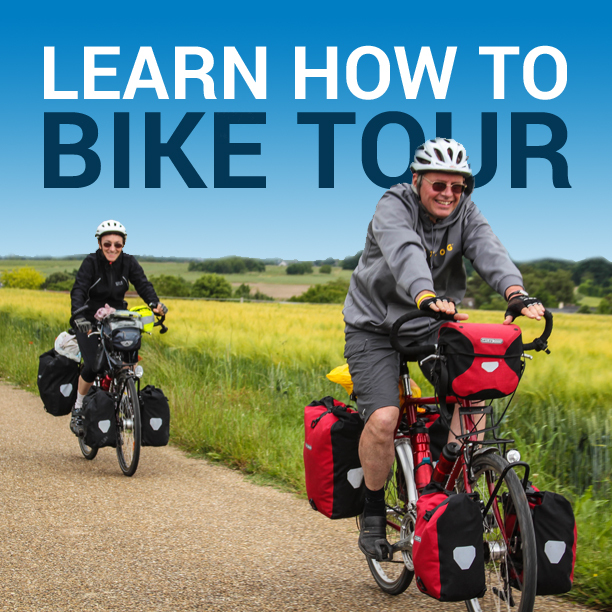 To sign up for the tour, simply contact John Klemme at the Bike Switzerland Welcome Center and he’ll give you all the information you need to place a tour reservation, make payment and arrange for your transportation to and from Switzerland. While I chose to come to Switzerland with my own touring bicycle, every other person participating in the Bike Switzerland Challenge Tour came to Switzerland without a bike and used one of the BMC hybrid bicycles that the company has on hand for these events. Bike Switzerland purchases a new set of BMC bicycles each and every year, so you know that the bicycle you’ll use on tour will be a good one. The company rents these bicycles out on a regular basis to people who are traveling in Switzerland for a limited time, so the bicycle you use on the tour may not be completely brand new, but it will be awfully close. Each bicycle is equipped with a Garmin eTrex GPS, helmet, handlebar bag, rear rack pack, water bottle, lock, multi-tool and cell phone. Of all the people I was traveling with on the Challenge Tour, not a single one of them had anything negative to say about the hybrid bicycles they were using. In fact, most of my travel companions were overjoyed at just how nice the BMC bicycles were. Some of them even wanted to buy the bicycle after the tour was over! 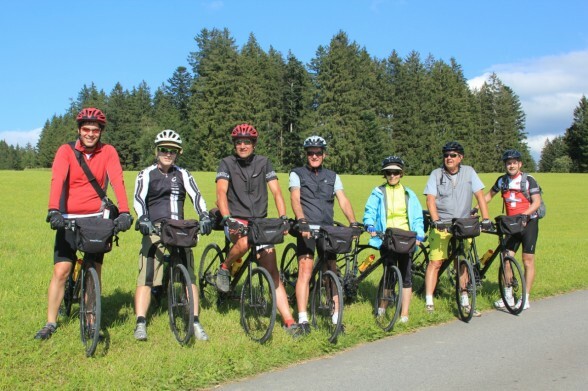 One of the most important aspects of any guided bicycle tour are the guides in charge of the tour itself… and Bike Switzerland has gathered up an exceptional group of guides and support staff for their tours. While John Klemme is the head of the company and has been in charge of leading several of Bike Switzerland’s bike tours in the past, he is now in the process of handing over some of those responsibilities to other individuals. As I’ve shared with you in the first part of this review, there were three other people (besides John) helping to lead this year’s Bike Switzerland Challenge Tour. There was Claude – our guide who rode with us every day and made sure we were traveling in the right direction; Mark – our driver and lunch man; and Eric – the intern who prepared our bicycles before we left Geneva. As the head of the company, John Klemme has taken on a lot of responsibilities and he does an excellent job of handling it all. John is kind, understanding, considerate, timely and incredibly knowledgeable. Best of all, this American-born businessman has been living in Switzerland for the past 20+ years, so he not only understands Swiss culture, but he also understands the concerns of his tour participants – many of whom travel to Switzerland each year from other westernized countries. Mark, the driver of the support vehicle and the man who prepared our lunches each day was friendly, outgoing and knowledgeable about the Swiss landscape, roads and history. An ex-pat from Britain, Mark and his wife moved to Switzerland a few years back and have since that time been slowly making Switzerland into their new home. As an outsider now living in the country, Mark’s view of Switzerland was similar to my own and to many of the other people participating in the tour. He didn’t see the Swiss country entirely like a Swiss national might, but saw the country with an outsider’s eye. I was glad to have Mark with us on the tour. He was an honest, outgoing individual and I considered him to be a vital player in the success of this year’s Challenge Tour. Eric, the intern, played a small role in the overall experience of the Bike Switzerland Challenge Tour. However, I found this tall, skinny young man from the western United States to be instantly accessible. He’s the kind of person you meet and feel as though you’ve known for years. With a exceptional knowledge of bicycles and a passion for new experiences, Eric is the perfect person to be working at a place like Bike Switzerland. Finally, there was Claude. As someone who has traveled by bike for more than fifteen years, Claude was certainly the most experienced cyclist in our group and I loved hearing his stories about cycling all around the world. While I was impressed with Claude’s kind disposition, friendly attitude and knowledge of bicycle technology, Claude did at times struggle with the GPS units we were using on tour and there were numerous occasions throughout the tour when we’d drift off course and have to double-back in order to continue heading in the right direction. That said, I think Claude has everything it takes to be an excellent bicycle touring guide. This was, admittedly, his first time leading a bicycle tour (and his first time using a GPS) and now that he’s done it I think he will do a much better job the second time around. He just needs a little more training and a little more practice with the GPS unit. Once he does those two things, I know that he’ll be a stand-out player in future Bike Switzerland tours. Besides the lush green landscapes, crystal clear lakes and beautiful farms and villages that we cycled through over the course of our 10-day bicycle tour, the hotels were another major highlight of the Bike Switzerland Challenge Tour. The hotels we stayed at each night were beautiful! Many of them came with breathtaking balcony views and the staff at each hotel spoke excellent English. Because we were often times eating both breakfast and dinner at the hotels as well, it should be noted just how good the food, service, and general dining experience on the Challenge Tour really is. John has gone out of his way to find the very best hotels in the area – not just hotels with clean rooms, but hotels that excel in every aspect – from dining to staff and everything in between. If I had to rate the hotels on a scales of 1 to 10, with 1 being the lowest and 10 being the highest, I would give the hotels on the Challenge Tour a 10. Seriously, they are that good! To be honest, I was a bit concerned about the food we might be served on the Challenge Tour. I’m a vegetarian, so it can sometimes be quite difficult for me to find food that I like when I am traveling. John assured me, however, that my dietary restrictions would be not problem… and he was right! The food that was served to us for breakfast, lunch and dinner was really, really good… and there was always something for me to eat – even as a vegetarian. While some of the dinners at the hotels were better than others, I would rate the food on the trip as a 9.5 out of 10 (and I’m a tough grader when it comes to food). There was really only one meal on the entire tour that I did not like (a mushroom and rice dish that was served to me as the vegetarian option at our second hotel in Chexbres). Except for that one dish, I loved every other meal that was served to us. We had fruit and bread, wine and cheese, vegetables and meat (no meat for me though), and desserts beyond belief. The very best food on the tour, however, was in Wengen, which was great because we stayed in that hotel for two nights and therefore got two delicious breakfasts and dinners while we were there. The food at that one hotel was so good I still dream about it sometimes in my sleep. And if I ever return to the Wengen area, I’ll know exactly where I’m going to go for dinner! Seriously, the food there was amazing!!! Would I Recommend The Bike Switzerland Challenge Tour? Overall, the Bike Switzerland Challenge Tour is an incredible experience. Whether you are an experienced cyclist with thousands of miles/kilometers under your belt or someone who is just now getting into cycling, there are countless reasons why I think you’d love the experience of riding your bicycle across the country on the Challenge Tour. The best thing about the experience, I think, is that once the tour is over you get the satisfaction of knowing that you’ve just ridden your bicycle from one side of the country to the other. The fact that you’ve been able to do that while at the same time seeing some of the most incredible scenery in the world, meeting new people, eating delicious foods and staying in fine hotels each night just makes the experience all that much better! If there are any down sides to the tour itself, the price would have to be one of them. While certainly competitive when compared to similar guided tours around the world, the price is going to be restrictive for some individuals. Overall, I’d give my experience on the Bike Switzerland Challenge Tour a 10 out of 10 rating. I whole-heartily recommend this bicycle tour for anyone who loves to ride a bike and wants to experience one of the best countries in the world for cycling, scenery and food. I loved the Bike Switzerland Challenge Tour. I loved every moment of it. I do think, however, that it could be even more amazing if just two simple things were added to the tour. 1. First of all, I would give both the leaders and the tour participants more training with the GPS devices and cell phones. Having each bicycle equipped with a GPS unit is so incredibly smart. It is one of the things I liked most about the Challenge Tour. Because I had the GPS with me on my bike, I knew that if, for some reason, I got separated from the group and needed to meet up with them later, I could easily do that. With the GPS mounted to my handlebars I always knew where I was going, despite the fact that I was cycling through a country that I was very unfamiliar with. That said, I was one of the few people on the tour who actually understood how to work the GPS units. Even Claude, the tour leader, was a bit confused about how to work his device. If I were running the Challenge Tour myself next year, I would spend a good hour at the start of the tour teaching the entire group how to operate not only their GPS units, but also their new cell phones. I would run the participants through a small training course near the Bike Switzerland Welcome Center and make the training with the GPS united into a fun game that could be played in a nearby park or on the streets of Geneva itself. The game would teach each person how to use the GPS units in a safe and somewhat familiar environment and would ensure that each person knew how to work the GPS before cycling off the next day on the start of the tour. 2. The other thing I would add to the tour is more information about the history, people and culture of the areas we were cycling through. Part of the reason I wanted to cycle across Switzerland was so that I could both see and get a sense of a large and varying part of the Swiss nation. While we did get to see a large part of the country, we didn’t really learn very much about Switzerland itself. We would stop at medieval castles, but were never really told about the history of the place. We sipped wine at local vineyards, but got very little information on Switzerland’s wine culture. Personally, I would have liked to have learned more about Switzerland while we were on tour. We cycled through so many amazing places, but they were just pretty things to look at rather than characters in a story of Switzerland’s past. If future Bike Switzerland tour leaders could disperse some information about Switzerland and the areas being cycled through to the tour participants at various points throughout the tour itself, I think that would take the experience of riding across Switzerland on bicycles to a whole new level. Ultimately, I’m super happy with my experience on the Bike Switzerland Challenge Tour. If given the chance, I would certainly come back and do it again. Frankly, I think that’s what’s most impressive about Bike Switzerland and the service that the offer. The fact that some of Bike Switzerland’s tour participants do indeed come back and do different tours (and sometimes even the same tour) over and over again says a lot about the company and the service that they provide. I could say a lot of really good things about my experience on the Challenge Tour. Seriously, I could go on and on. But the fact that some of this year’s Challenge Tour participants will be coming back to Switzerland next year says more than I could ever say. For more information on Bike Switzerland, the Challenge Tour or any of the other bicycle tours that Bike Switzerland has to offer, be sure to visit the website at www.bikeswitzerland.com. This entry was posted in Bicycle Touring Pro Articles, Europe, Featured Articles, Locations, Main Articles, Product & Service Reviews, Switzerland and tagged bicycle rentals switzerland, bike switzerland, bike switzerland challenge tour, bodensee, challenge tour, cycling in switzerland, geneva bicycle shop, geneva bike tours, guided bike tours, guided tour, lake constance, luzern, swiss bike shop, switzerland, switzerland bicycle adventures, switzerland bicycle tours, tour guide. What a wonderful holiday coupled with a great write-up to encourage your readers to participate in the tour another time. I’ve bookmarked this page and will come back frequently to read… and hopefully during another summer will actually do it. My problem is I have no rhythm nor gears for hills… having been riding only fixed-wheel since teenage schooldays (and I’m now 68), and, for the past decade in the flatish and very gentle sud-Touraine region of central France. And boy, do those Swiss mountains and mentions of 5,000 meters of climbing per day make my legs shudder at the thought! However, you have provided ample inspiration… well done! Steve, I’m not sure about camping along the way every night, but I’m sure there are campgrounds in some places. I would have to do some research on that. I’m not really sure. You might want to contact Bike Switzerland even if you can’t do the group tour because they know the route so well and they do have some self-guided options that are available. They might also be able to help you with finding alternative places to sleep/camp, etc. wooow …. beautiful scenery when …… I get there …?